Few days ago, we reported that a suspected kidnapper who took tramadol as he attempted to kidnap a pharmacy owner, slept off at his victim’s house. In a new update released by the Police, it has been gathered that suspect whose identity is yet to be confirmed by the Ondo State Police Command, was still sleeping six days after he was taken into custody. The suspect who took tramadol, was arrested by men of the command on Sunday as he and three other members of his gang attempted to kidnap a pharmaceutical shop owner in Owo town. The victim of the attack had raised an alarm and escaped through the back door, when the three-man gang stormed the shop with guns with the intention of kidnapping him. Though the suspect had tried to escape on a motorcycle he reportedly snatched from a customer of the shop owner, however he stumbled while he was trying to ride it while other members of the gang were said to have taken to their heels. 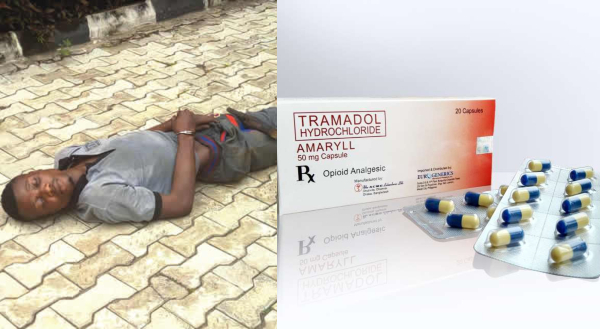 The Ondo State Police Command disclosed that a 400mg tablet of Tramadol was recovered from the pocket of the sleeping suspect, which raised the suspicion that he must have taken the drug before he went for the operation.